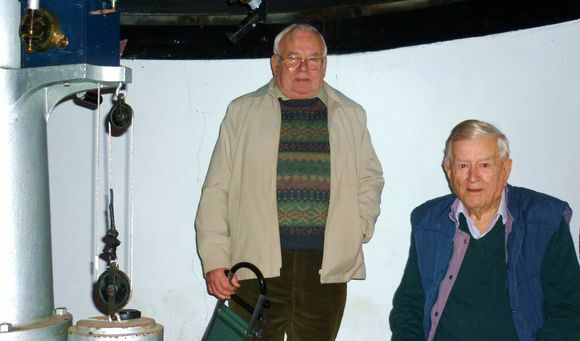 After receiving a most intriguing email from Mr Jim Storey, concerning a Mr Norman Wright, who was keen on visiting the Bruce Observatory, it was arranged to meet up with Jim and Norman at the observatory on February 17th. Fortunately it was a fine evening, with a gibbous moon visible. Norman, who is 91 and is a Bruce family relative, had never been in the Observatory before, or knew too much about it. He is keen however to see that it does not fall into disrepair (more on this next month). Although unable to look through the telescope satisfactory, Norman nevertheless appeared to thoroughly enjoy his visit, and hear an account of its history (at least the parts we know of) as well as the restorative work and subsequent use by society members.